King John Castle rises proudly above Munster Province and County Limerick. The Castle is located in Southwest Ireland, but it is still easily reached by car from the Dublin Airport. The journey of approximately two hours starts by getting on M7 for about 90 minutes and then veering onto R445 until you reach the city center of Limerick and spot the signs leading to the parking area for the Castle. Although it was built in the year 1200, it is one of the best-preserved Norman castles in all of Europe. Multiple stone watchtowers and an enormous wall helped protect the castle and its inhabitants from several major sieges throughout history. Today, the castle grounds contain a museum, an extensive visitor's center and even an onsite cafe with views over the River Shannon. Guided tours of the castle's interior are available, which gives you the chance to walk atop the castle's stone walls. As far back as the 10th century, Vikings lived on King's Island. By the beginning of the 13th century, King John himself ordered that a grand castle be built on the island. The location of the castle, and the Viking settlement before it, was chosen for its proximity to water. From King's Island, residents could raid the length of the River Shannon and better protect itself from invasion. King John Castle is largely responsible for the growth of Limerick. With the castle keeping watch over the area, local residents could thrive and prosper without fear of war. The city of Limerick became incredibly wealthy. In fact, a mint was set up within the castle so that currency could be made right onsite. The Castle is designed to withstand sieges. 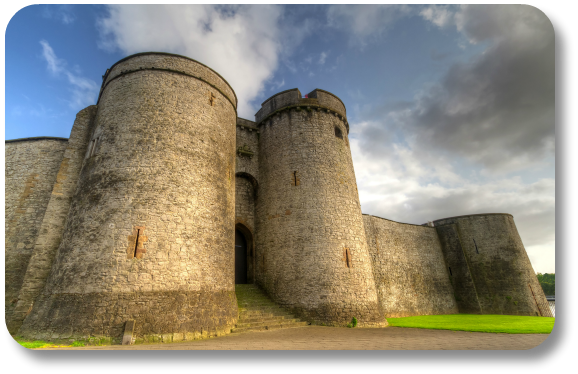 However, the 1642 Siege of Limerick was so severe that it caused permanent damage to the castle walls. Invading forces couldn't penetrate the walls, so they dug through the foundation! Today, the castle is open to the public. It is a major attraction in Limerick and a worthwhile stop for all ages. A great place to start your visit to is by climbing up to the battlements. You'll be treated to a 360-degree view over the castle as well as the surrounding city. The castle itself has been restored carefully. You can walk up and down the stairs, explore many of the rooms and get a feel for what life was life in centuries past. Costumed staff stroll the halls of the castle. They act as carpenters, make coins at the castle mint and show visitors some of the medieval skills that were once part of everyday life on King's Island. Take time to speak to those in period costumes. They are happy to share historical facts about the castle, but they will also share gossip about its residents! You can find more information about this lovely Irish landmark here.